President Obama wants to show the Islamic world how kind, gentle and multicultural America can be. Sweden is a role model in being kind, gentle and multicultural. The following story from the Bildzeitung of Germany shows just how rewarding this policy is for those who practice it. Bombs were detonated in four Swedish supermarkets with time delay fuses. According to the Swedish newspaper "Svenska Dagbladet"police are focusing on a group known as "Global Intifada".The thuderous fiery explosions were reported in four supermarkets in the city of Sodertalje west of Stockholm. No one was injured. Three of the four supermarkets attacked were totally destroyed. Other grocery store owners reported receiving "warning letters" in the past two weeks signed by a group called "Global Intifada". The letters threatened that fires would be set to protest the war in Iraq. Sodertalje is known in Sweden as a town with a high percentage of Iraqi refugees. This should be a lesson to Obama. All the countries that try to be kind, gentle and multicultural end up getting a kick in the teeth for it. 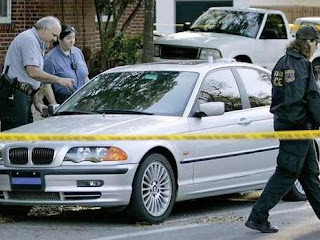 John Waldo of Gainesville Florida sat dead for fifteen days in his car. Waldo, who had been missing since February 11 was found sitting on the passenger side of the vehicle, according to police spokesman Bennie Smith. He had his car key with him. A loaded pistol was found in the trunk. It remains to be established why Mr. Waldo's death went unnoticed for so long. Policie did note that his illegally tinted windows made it harder to notice him sitting in the car. How and why did Waldo die. The autopsy was inconclusive. There was no conclusive cause of death established. Further testing for drugs and poison are pending. As a New Yorker I am concerned. Mayor Bloomberg has been looking to tax everything he can. Seven tickets to someone who is dead... Hmmm. I can imagine what must be going through Bloomberg's head when he reads this story. Up until now death has been a protection against being ticketed. I can just imagine the cops putting chalk around a crime scene and getting a ticket for graffiti. I was listening to the radio the other day and an Australian singer came on named Missy Higgins. It has been a long while since I have heard any music from Alanis Morrisette. The sad, introspective quality in Higgin's music reminds me a bit of Morrisette. Higgins is now 25 years old and has been singing professionally since the age of 17. She has two albums out. The song below was featured on Grey's Anatomy. Her liberal politics include support of PETA. There is probably a lot she supports that I do not. If I only listened to the music of those who shared my political views, my collection of music would be very small. The following is a public service video reminding us of the terrible conditions endured by North Koreans. The video is done as a comedy skit. Unfortunately, it is probably pretty close to the actual truth. Watch it , enjoy it and do something. There are charities out there helping the North Koreans. Check them out.